A partnership with LIAF provides a well-respected (and of course an enormously fun!) platform to connect with an enthusiastic and receptive audience. We offer a variety of valuable opportunities to promote your company in the form of Festival publications, on the big screen, at venues, online, through merchandising and through customised packages that suit you. At LIAF we truly value all financial and inkind support no matter how big or small. an invitation to this year's LIAF launch party at The Barbican (this is a guestlist only event, tickets are not onsale to the public). medium logo presence on the Partners page of our website as a Cultural Partner (including a direct link to your site) and up to 50 words of supporting copy*. a half page black & white advert in this year's LIAF Catalogue (worth £50). a welcome letter from our Director. one LIAF Membership Card entitling you to discounts at selected LIAF events*. our most recent Festival highlights DVD (RRP £18.99). an advance copy of our Festival Catalogue (worth £5). advance notification of future LIAF events. promotional opportunities at LIAF events - becoming a LIAF Partner gives access to the options available within our Gold Package. ** discounts will vary from venue to venue, but as a generally rule will be approximately 10%. Discounts valid for one year. an invitation to the LIAF launch party at The Barbican (this is a guestlist only event, tickets are not onsale to the public) and other events. ten tickets to the Festival (worth approximately £100). large logo presence on the Partners page of our website as a partner (including a direct link to your site) and up to 100 words of supporting copy*. a full page black and white advert in our catalogue (worth £75). a cyclical (1 of 10) banner ad on our website visible on every page (worth £500). logo presence on a pre-screening still visible at all Festival screenings, from door opening until five minutes before screening begins (worth £250). one LIAF Membership Card entitling you to discounts at selected LIAF events**. a DVD of our previous year's Festival highlights (RRP £18.99). At LIAF we understand the value of working together: sharing expertise; exchanging products and services; combining reputations and making introductions. We also understand that not everybody's requirements are the same and so customisable packages sometimes yield better results all-round. We are actively seeking relationships with organisations and businesses that can support us in realising our vision. Just as importantly, we are always receptive to hearing propositions from like-minded organisations and businesses. If you're interested in finding out more about what LIAF has to offer, here's a quick snapshot of some of the extra opportunities we reserve for our bespoke packages. 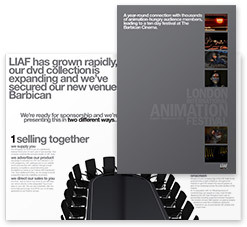 To find our more, please download our A Partnership with LIAF Brochure (3.71MB PDF). sponsoring a LIAF award, screening or event. If you'd like a chat about forming a relationship with LIAF, please visit our Contact page and get in touch, we'd love to hear from you.